The evolution of Southern California hockey hit a high point when two local products were chosen at Staples Center in the first round of the 2010 NHL Draft. Though much attention was centered on Long Beach native Emerson Etem, selected 29th overall by Anaheim, it was actually Beau Bennett of Gardena that became the highest drafted Californian in NHL history when he was selected 20th overall by the Pittsburgh Penguins. Bennett, who will turn 22 in November, is a former Los Angeles Jr. King who was a roommate and linemate of Kings prospect Nick Shore at the University of Denver, where he played from 2010-12. After a breakthrough offensive performance at AHL-Wilkes-Barre Scranton, he logged 14 points (3-11=14) in 26 regular season games with Pittsburgh before seeing stretches of time in the playoffs alongside Evgeni Malkin and James Neal. His first career goal came on a power play one-timer off a cross-ice saucer pass from Sidney Crosby in a 5-3 win over Tampa Bay on February 24. The 6-foot-2, 207 pound right-handed shot made a successful transition to left wing for the Penguins deep in the season and is one of the 48 players – and one of 16 born in the 1990’s – invited to the U.S. Men’s National Team Orientation Camp in late August in advance of the 2014 Winter Olympics. Bennett has been training at Toyota Sports Center in July and took time earlier this month to speak with LA Kings Insider about his development from the LA Junior Kings to the National Hockey League, his surprisingly late start in ice hockey, and his lifelong Kings fandom that has to take a back seat to his Pittsburgh Penguins focus. LA Kings Insider: So is it great to be back at Toyota Sports Center for these summer workouts? Beau Bennett: Yeah, definitely. It’s fun to come home every summer, and we’ve got a pretty good group of guys that come down here in the summers. They love it here in California, and I love to be around my friends and family and still get good skates in here at this rink. LAKI: How long did you play roller hockey before making the transition to ice? BB: I played roller for about four years before I started going to ice. But I didn’t really make the transition to ice until I was like 15. I still played half and half, like half the year ice, half the year roller until I was about 15. LAKI: That’s a very late start. 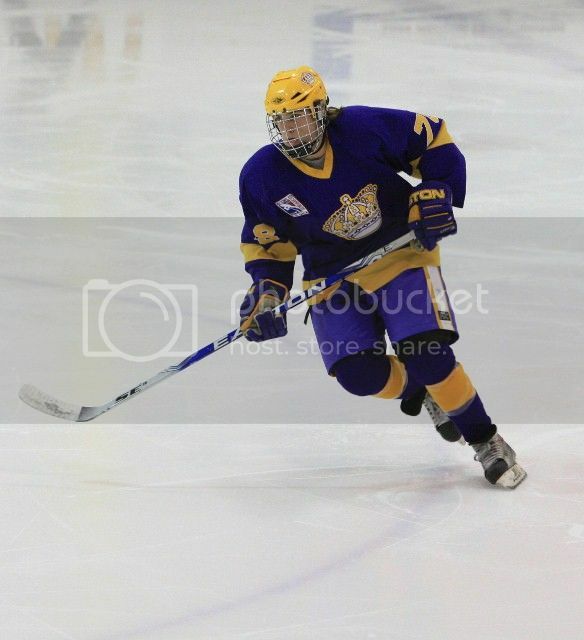 How did your development accelerate over your 15, 16, 17 year-old seasons in your full transition to ice hockey? BB: It definitely helped when I was just focusing on ice hockey. I still love roller hockey. It definitely is a fun sport to play, fun game to play. Over the years I’ll probably go back and even keep playing – at the time being, I’ve just got to keep focused on ice hockey. LAKI: What does it mean to you to play against the Kings at Staples Center this year? BB: It’d be awesome, because my grandma and aunt, they don’t travel, and they’ve always supported me. I definitely want them to come out and watch. They were there at the draft in 2010, so it’ll be awesome if they got to come out. LAKI: How would you describe working with Sidney Crosby on the power play in setting up your first NHL goal? BB: It was awesome. I was lucky enough to get a chance to be out there. We had a couple guys hurt and it was a five-on-three. I just tried to get open when those guys are out there, and luckily he saw me, and he made the pass he usually makes. LAKI: How would you characterize your first professional season and ascension to the Penguins’ roster? BB: It was awesome. It was a learning experience. Just being in Wilkes-Barre first, I learned a lot there and experienced the training camp during mid-season. It was awesome. I had my ups and downs like most first-year players, but it was definitely a great thing to move forward and take it into the summer and summer training. 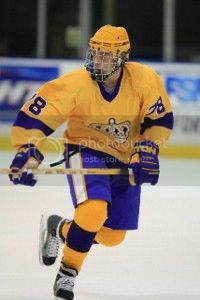 LAKI: Is there any type of scouting report you could give us on Kings prospect and former Denver Pioneer Nick Shore? BB: He was my linemate both years in Denver, and he was my roommate freshman year. Me and Nick are pretty good buddies. He’s a smart player, that guy. I enjoyed playing with him. He thinks the game at another level, and that’s what’s going to help him excel at this level. LAKI: So how big of a Kings fan were you? BB: [laughs] Oh, I was the biggest. I was the biggest Kings fan. You know, when I was drafted and Pitt was out, I wanted to see the Kings win, just because they hadn’t won. So it was good to see them get that first one. But from here on out, it’s Pittsburgh all the way. LAKI: Did you make it in for Game 6 of the Stanley Cup Final in 2012? BB: I was outside the building. It was nuts. To see that kind of hockey pride within the state is pretty awesome. LAKI: So you were watching on the screens outside? BB: Yeah. It was cool to share that experience with all my friends that grew up playing here. We were kind of inspired by the team, so it was definitely a great experience.